A Royal Worcester Flamingo Painted Vase And Cover By G. Johnson. 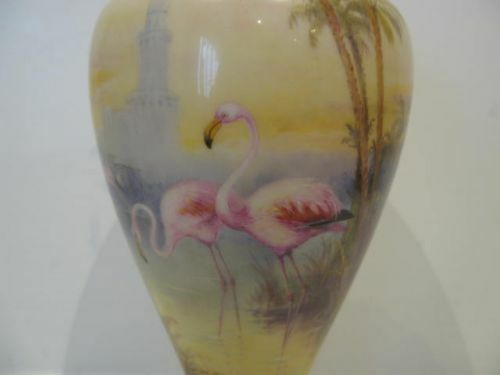 An attractive Royal Worcester porcelain vase and cover, shape number F106, with a very well painted scene of a pair of flamingos wading by a palm tree fringed riverbank with buildings on the opposite shore, by the specialist artist George Johnson, described in Henry Sandons "Royal Worcester Porcelain" book as "Master in his own field". Standing approximately 9.1/2"overall height x 4"diameter, it has the puce factory stamp for 1925 and is in lovely condition with no damage, crazing or restoration, and the gilding is virtually without wear. 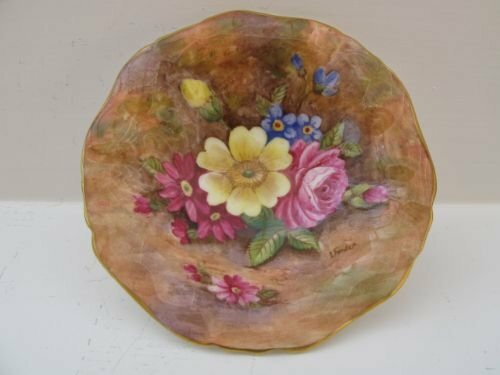 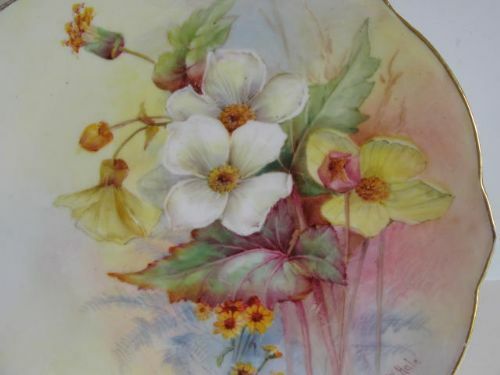 A Royal Worcester Floral Painted Cabinet Plate By W. Hale. 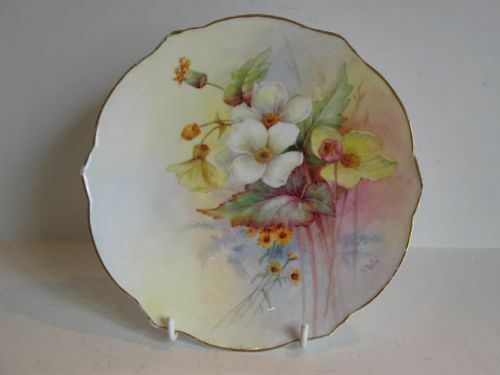 A Royal Worcester shaped edge porcelain cabinet plate, with an excellently painted study of summer flowers and foliage by William Hale. 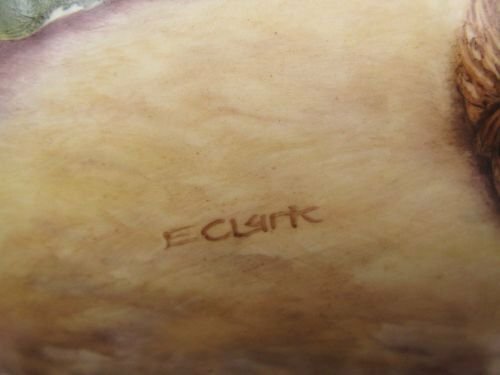 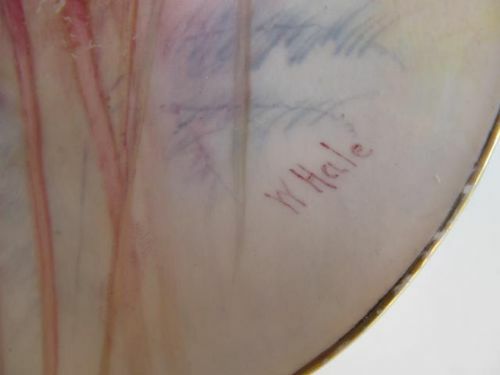 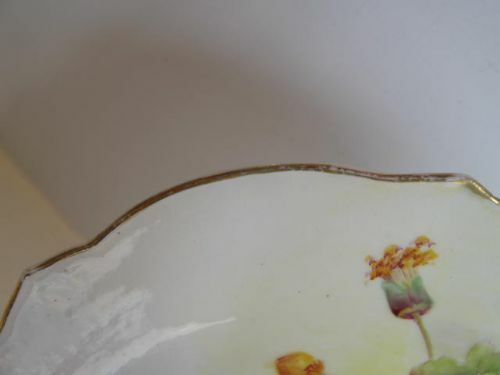 Measuring approximately 8.1/4"diameter x 3/4"deep, it has the puce factory stamp for 1931 and is in good condition with no damage, crazing or restoration, and the gilding is bright but does show some rubbing to the rim. 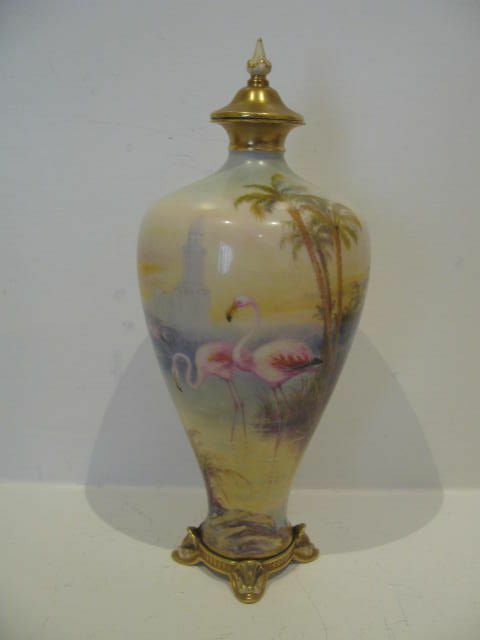 A Royal Worcester Flower Decorated Blush Ivory Vase. 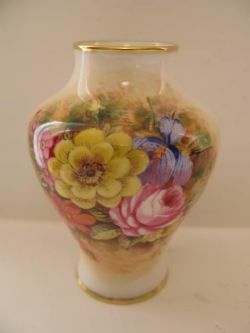 A small and attractively shaped, Royal Worcester porcelain pedestal vase, shape number 1727, with well painted summer flower decoration. 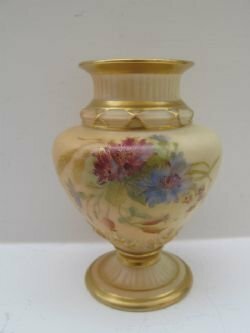 Standing approximately 4"tall x 2.3/4"diameter, it has the puce factory stamp for circa 1909 and is in excellent condition with no damage, crazing or restoration, and the gilding is fresh and unworn. 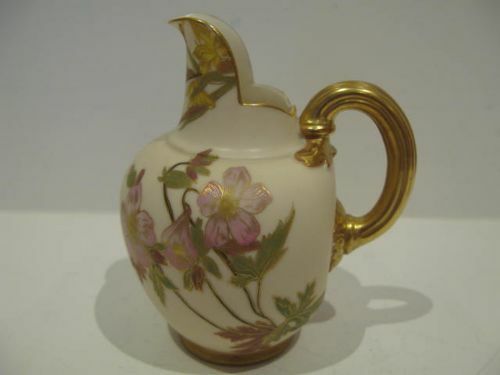 A Royal Worcester Flower Painted Blush Ivory Cream Jug. 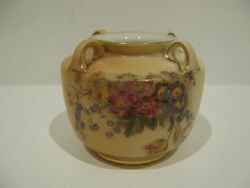 A small, Royal Worcester porcelain cream jug in the form of a rustic coopered barrel, with nicely painted summer flower and foliage decoration. 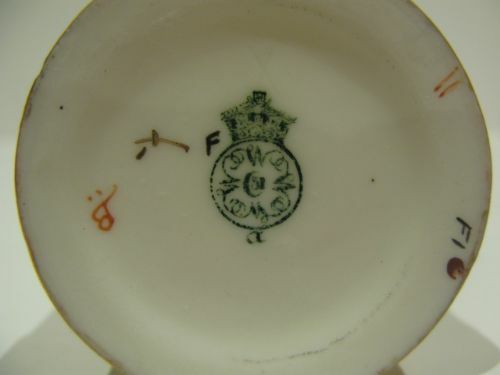 Standing approximately 2"maximum diameter x 2.1/2"high, it has the dark green factory stamp for 1890 and is in excellent condition with no damage, crazing or restoration and the gilding is virtually without wear. A Royal Worcester Flower Painted Four Handled Vase. 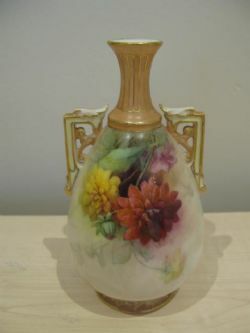 A good, Royal Worcester blush ivory porcelain vase, shape number 991, with 4 loop handles and painted summer flower decoration. 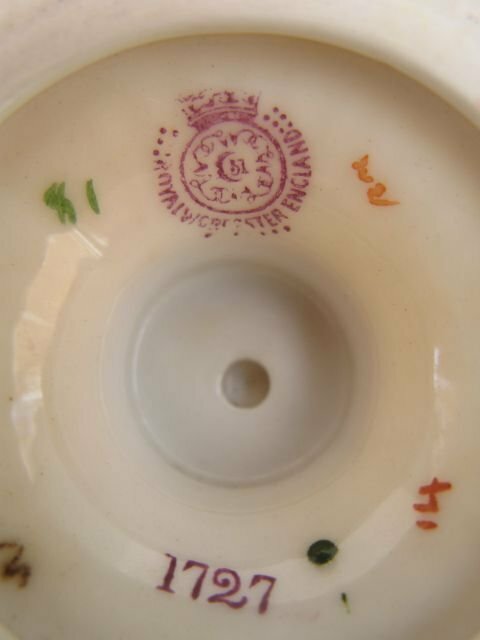 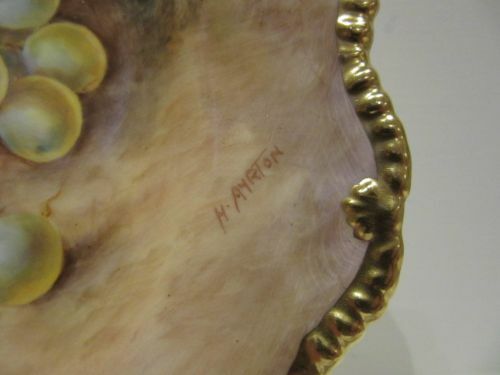 Standing approximately 3"tall x 3.1/2"diameter with the puce factory stamp for 1891, it is in very good condition with no damage, crazing or restoration and the gilding is fresh and without wear. 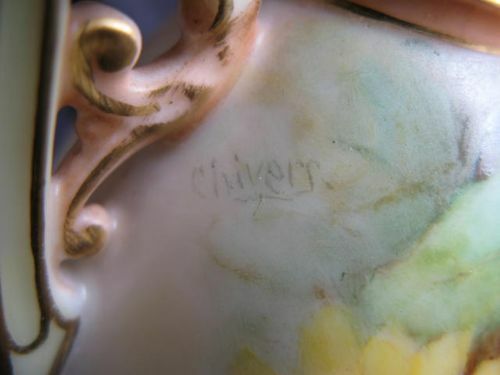 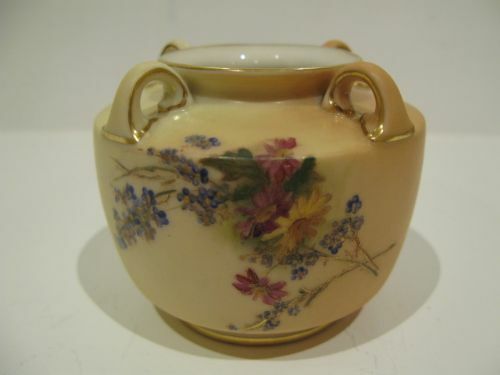 A Royal Worcester Flower Painted Vase By Chivers. 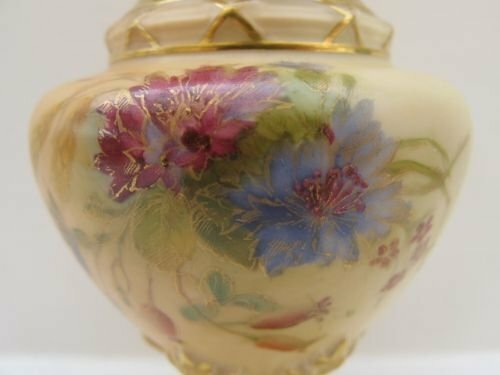 An attractive Royal Worcester porcelain two handled vase, shape number 1539, decorated with well painted dahlias by Frederick Chivers. 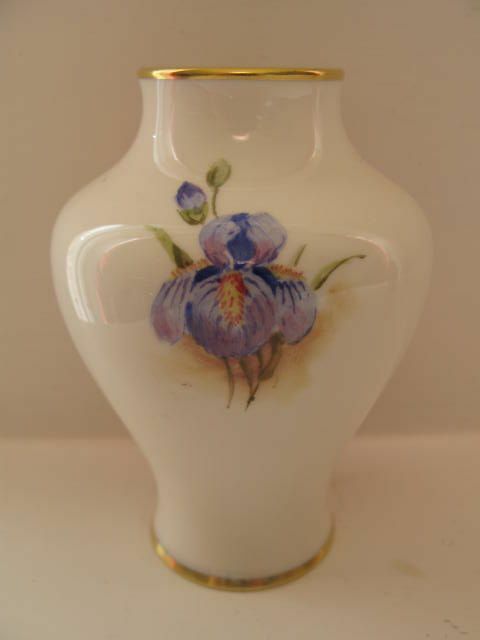 Standing approximately 6.1/8"tall x 3.1/4"diameter, it has the puce factory stamp for 1903 and is in very good condition with no damage, crazing or restoration, and the gilding shows only the slightest signs of wear. 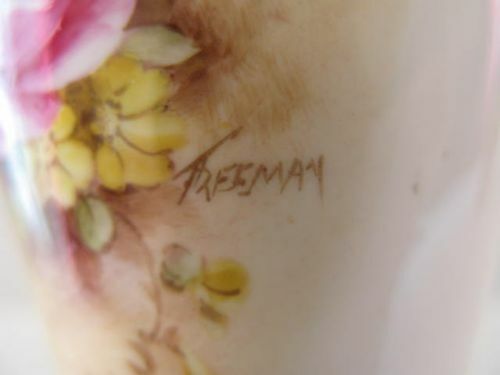 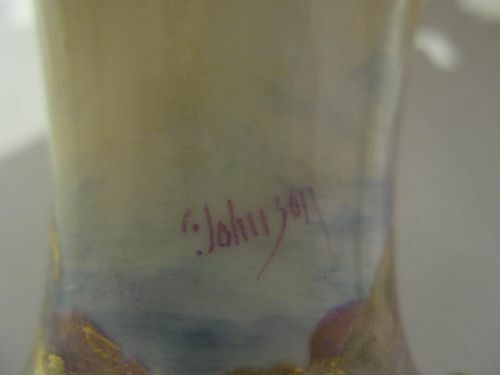 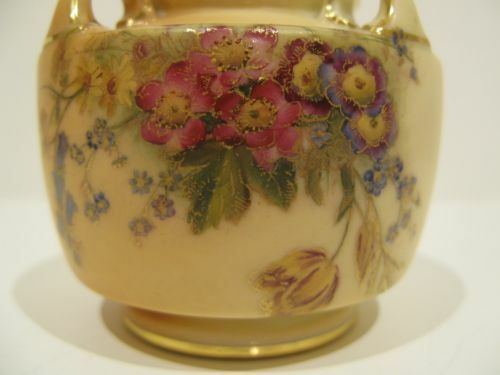 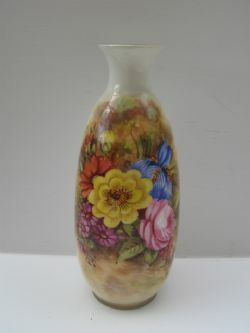 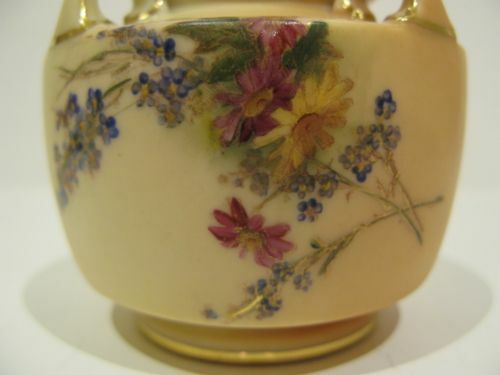 A Royal Worcester Flower Painted Vase By J. Freeman. 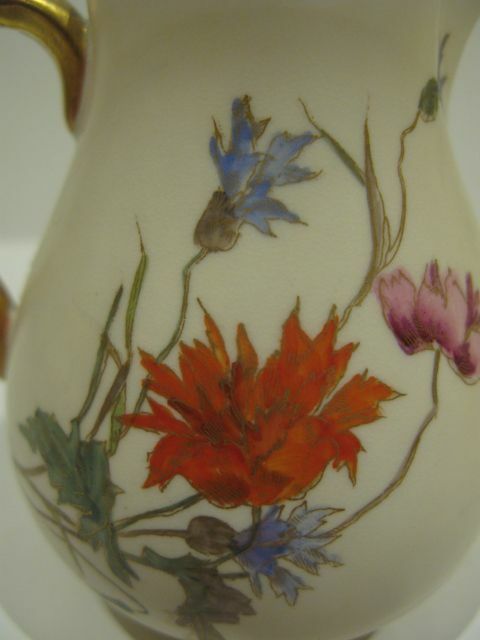 A Royal Worcester porcelain vase, shape number 2491, painted by John Freeman with flowers and foliage. 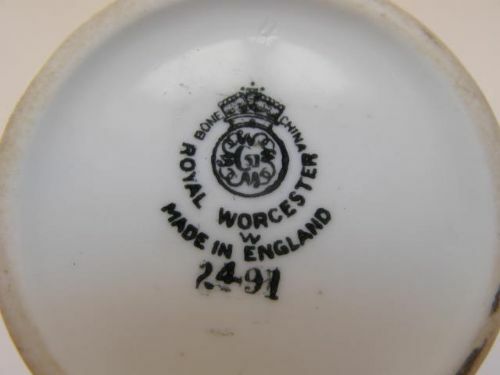 Standing approximately 4.1/8"high x 3"diameter and with the black factory stamp for 1950, it is in excellent condition with no damage, crazing or restoration and the gilding is fresh and unworn. 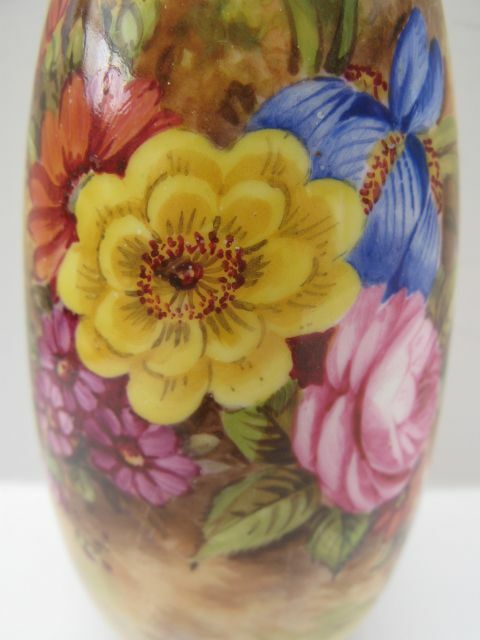 A Royal Worcester porcelain vase, shape number 2491, with boldly painted flower decoration by John Freeman. 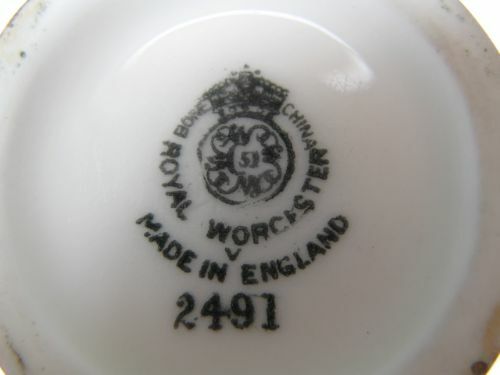 Standing approximately 5.1/2"tall x 2.3/8"diameter with the black factory stamp for 1949, it is in excellent condition with no damage, crazing or restoration, and the gilding is virtually unworn. 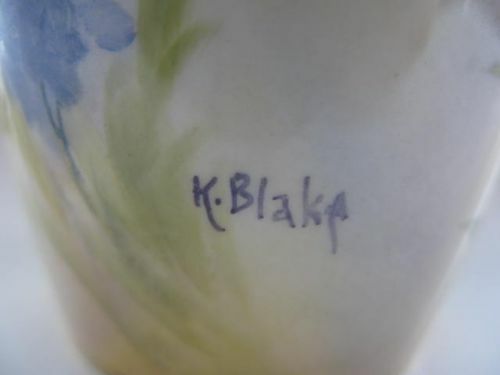 A Royal Worcester Flower Painted Vase By K. Blake. 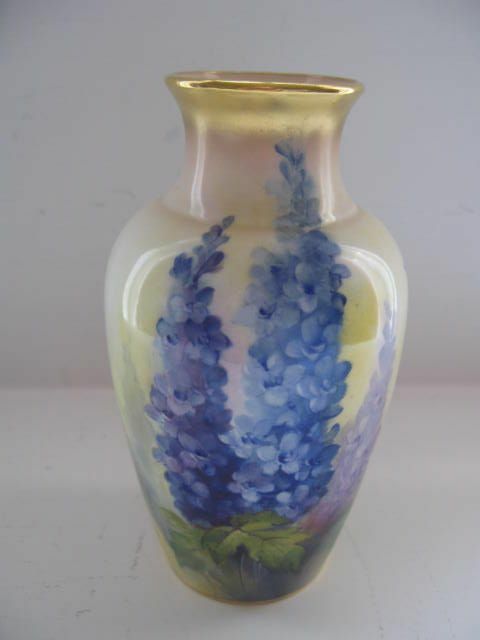 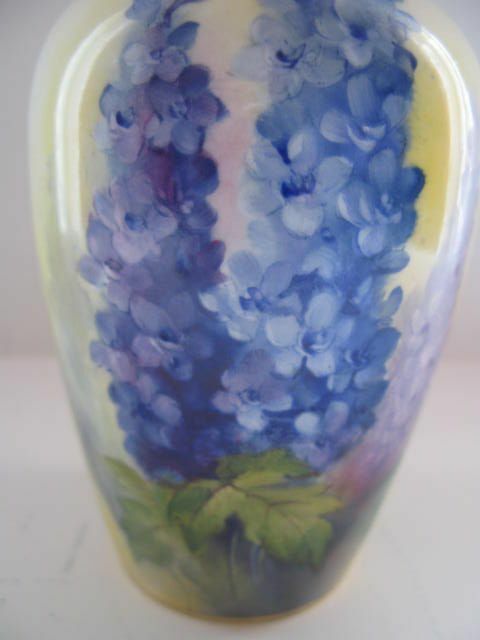 A Royal Worcester porcelain vase, shape number 2226, with a well painted depiction of Delphiniums by Kitty Blake, more normally known for her blackberry fruits and flowers in autumnal tones. 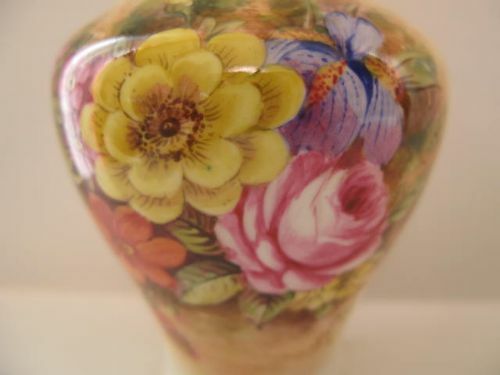 Standing approximately 5.7/8"tall x 3.1/2" maximum diameter, it has the puce factory stamp for 1931 and is in very good condition with no damage, crazing or restoration, and the gilding shows very little sign of its age. 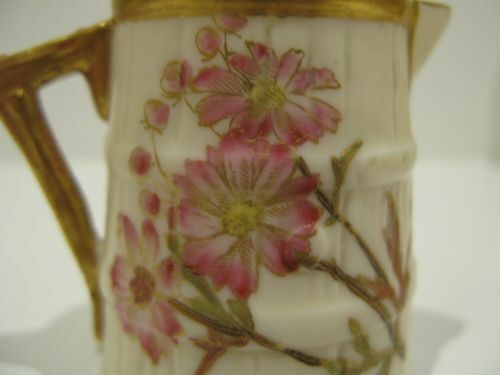 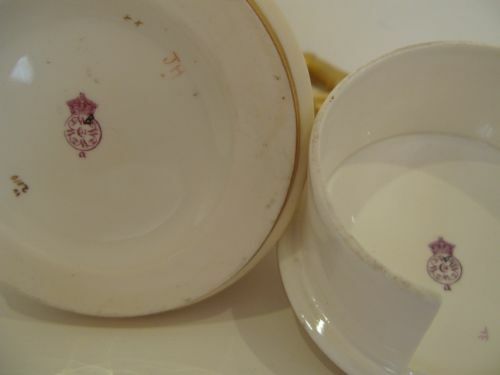 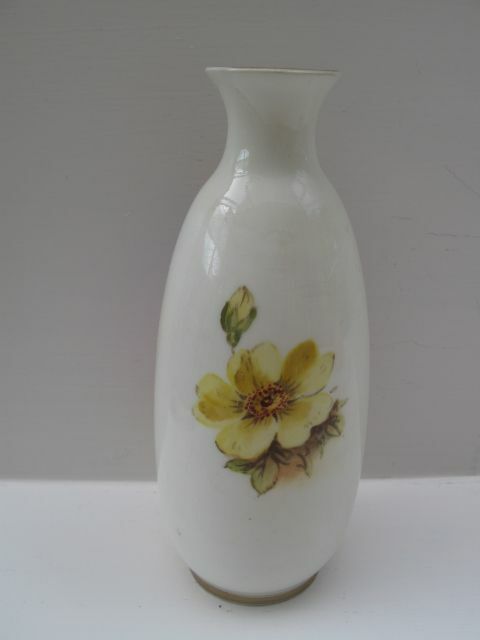 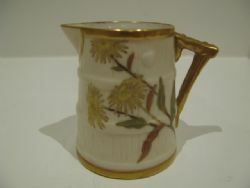 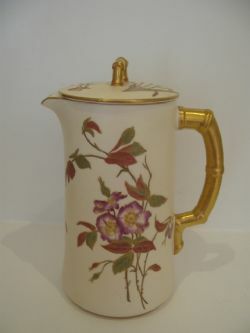 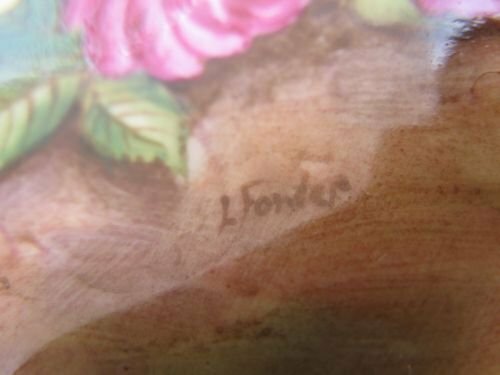 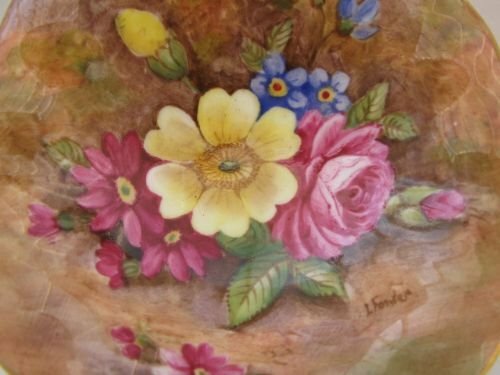 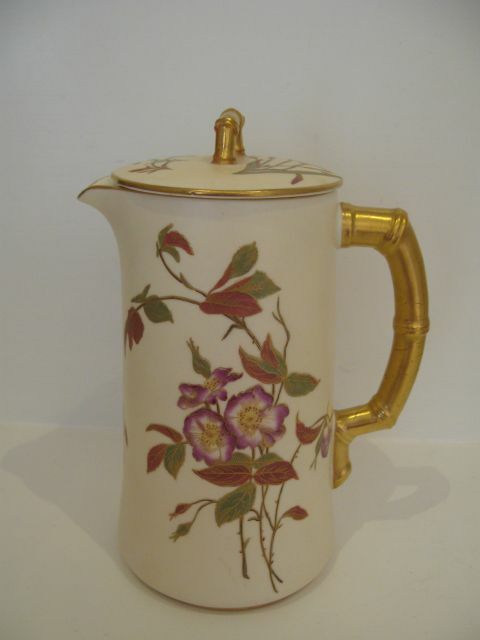 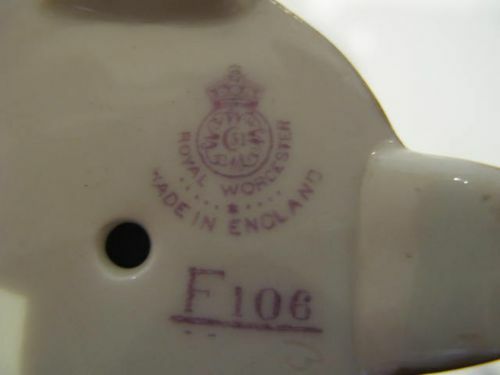 A Royal Worcester Flower Painted, Blush Ivory Coffee Or Water Jug. 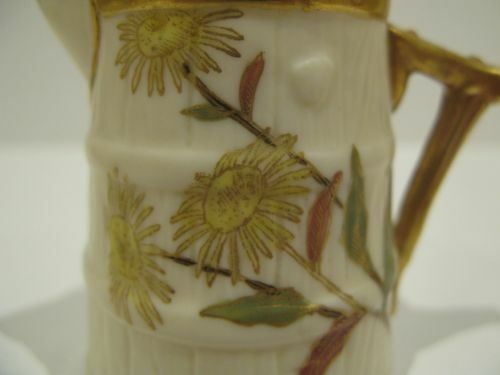 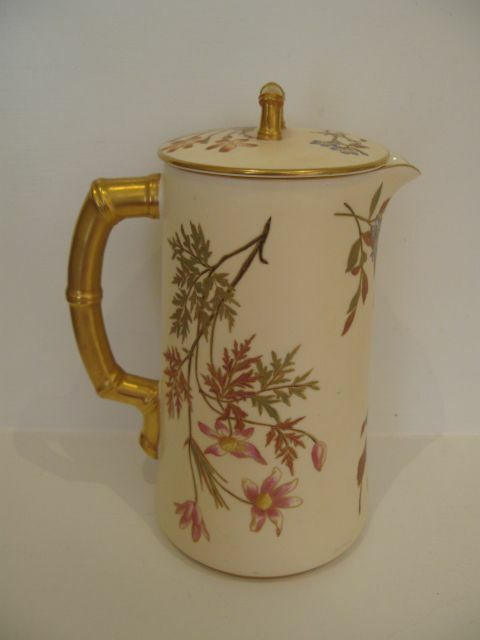 An attractive, Royal Worcester full sized porcelain coffee or water jug, the pale blush ivory body with painted summer flower and foliage decoration, and simulated bamboo handle. Standing approximately 8.1/2"tall x 4.1/2"diameter, both it and the lid have the puce factory stamp for 1890 and are in very good condition with no damage, crazing or restoration, and apart from the gilding to the handle showing some small signs of use as shown in picture 4, it also is in very good condition. A Royal Worcester Flower Painted, Blush Ivory Cream Jug. 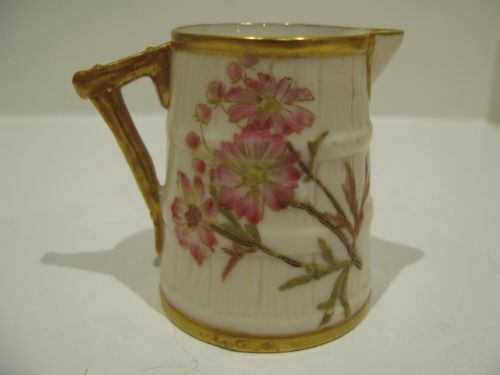 An attractive, Royal Worcester blush ivory porcelain cream jug, decorated with well painted summer flower and foliage decoration. 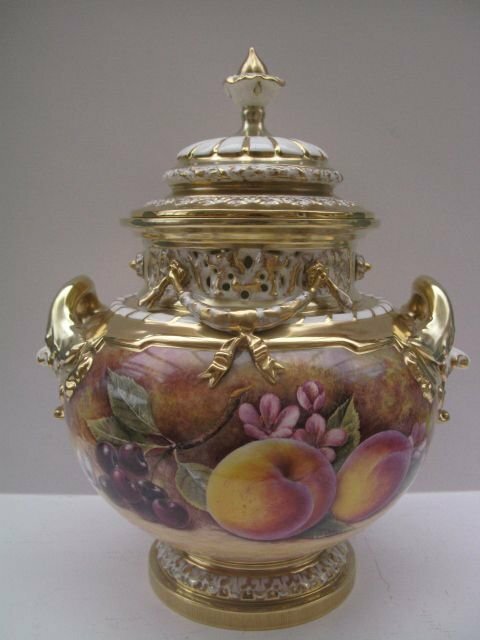 Standing approximately 3"diameter x 3.5/8"high, it has the puce factory stamp for 1891 and is in excellent condition with no damage, crazing or restoration and the gilding is virtually without wear. 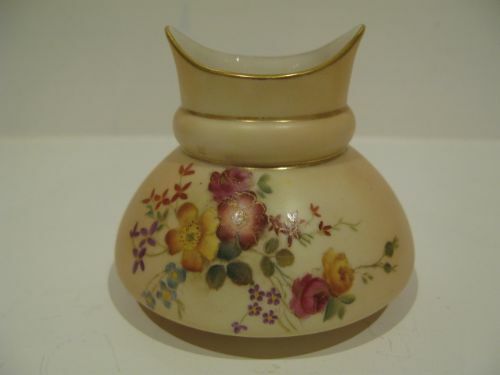 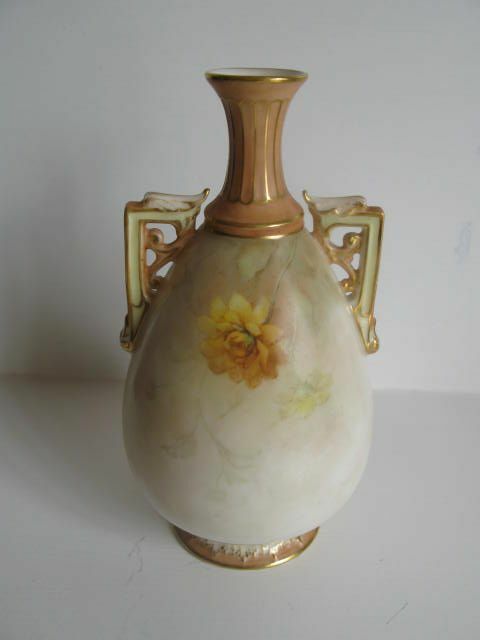 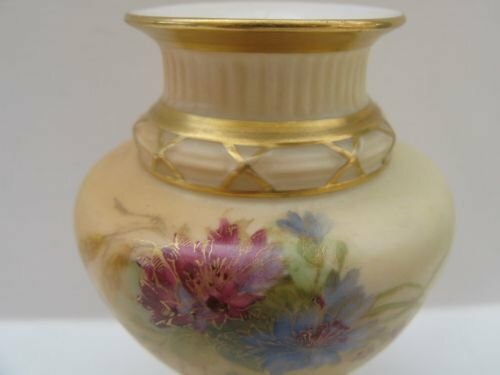 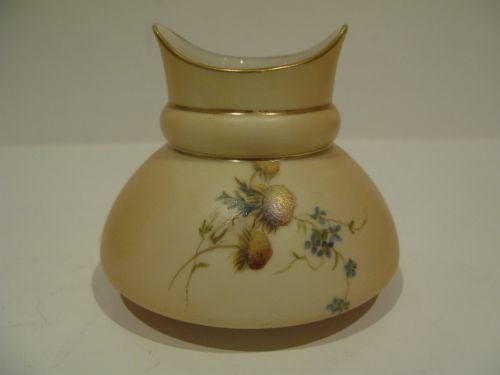 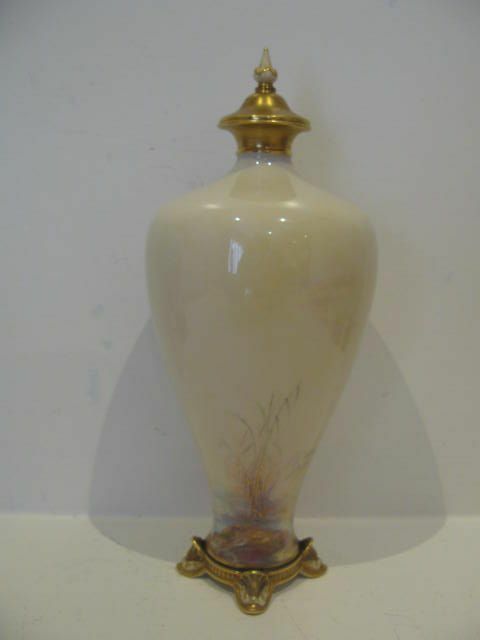 A Royal Worcester Flower Painted, Blush Ivory Vase. 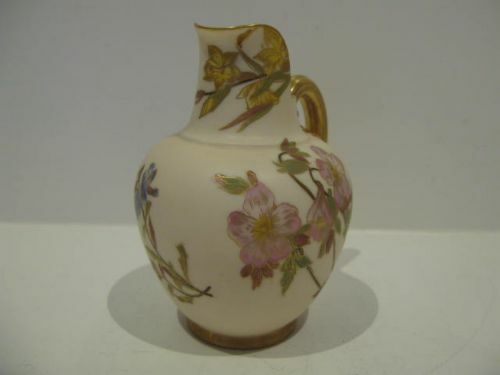 A nicely shaped, Royal Worcester blush ivory vase, shape number 991, with summer flower painted decoration to the front and reverse. 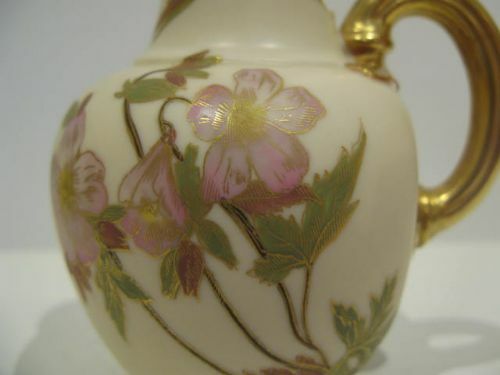 Standing approximately 3.1/4"tall x 3.3/4"wide, it has the puce factory stamp for 1897 and is in excellent condition with no damage, crazing or restoration and the gilding is bright and virtually without wear. 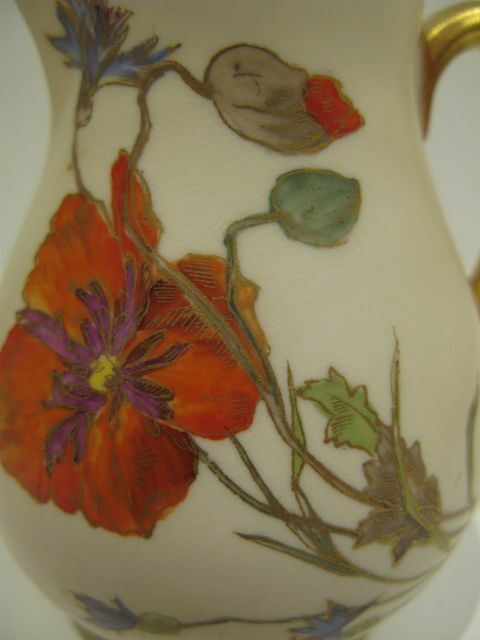 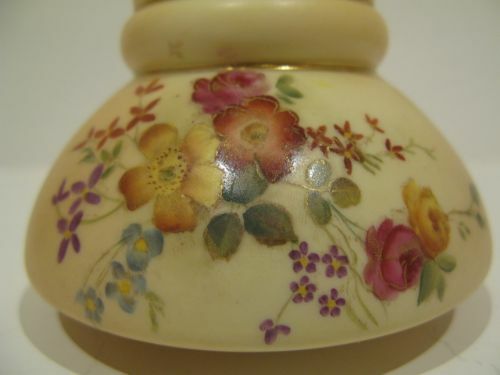 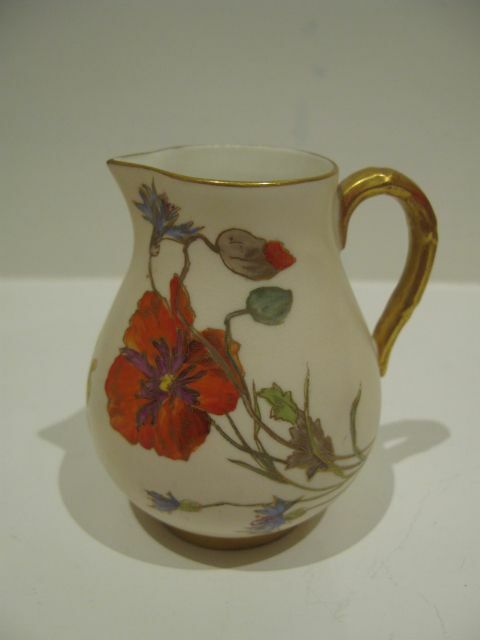 A Royal Worcester Flower Painted, Ivory Jug. 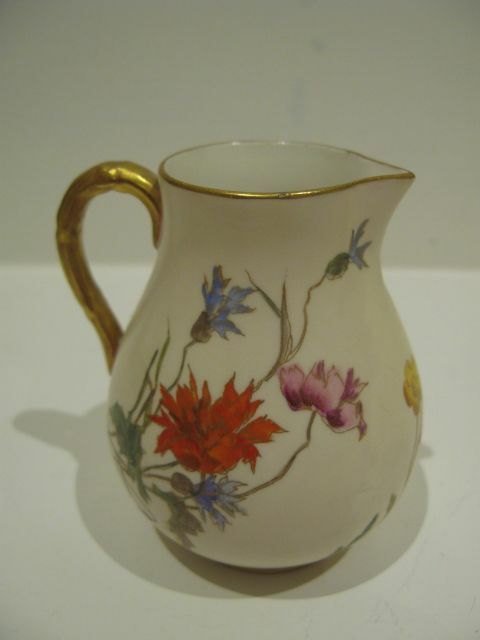 A Royal Worcester porcelain jug, shape number 1094, with flower and foliage painted decoration highlighted in gilt. 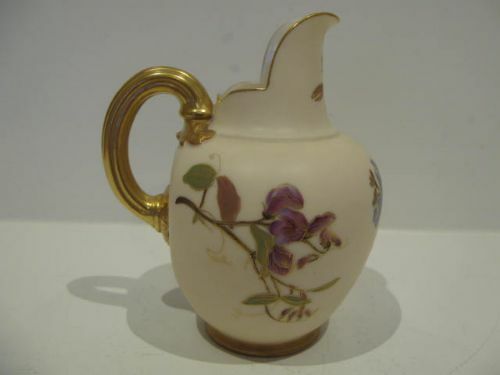 Standing approximately 5"tall x 4.1/4"wide over the handle, it has the puce factory stamp for 1893 and is in excellent condition with no damage, crazing or restoration, and the gilding is bright and virtually without wear. 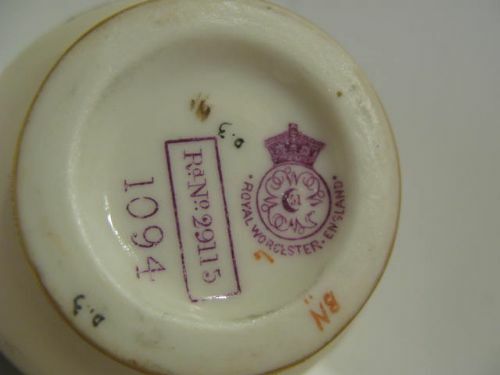 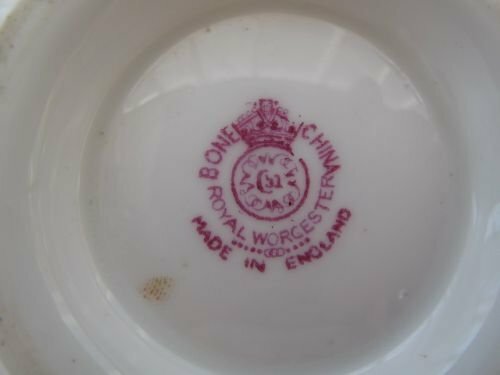 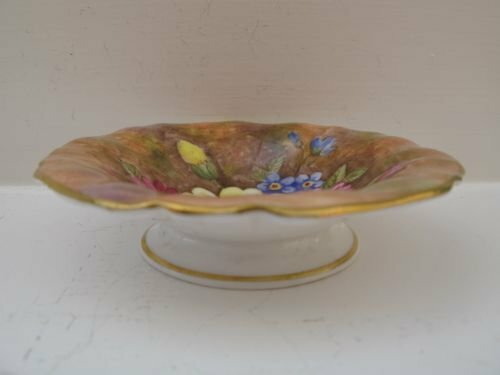 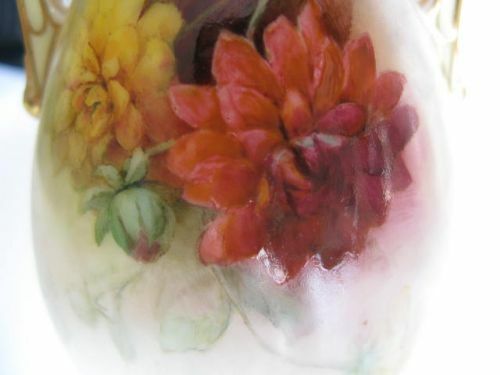 A Royal Worcester Footed Pin Dish, Flower Painted By L. Fowler. A small, Royal Worcester footed pin dish with shaped edge, and very attractive flower painted decoration by Leslie Fowler. 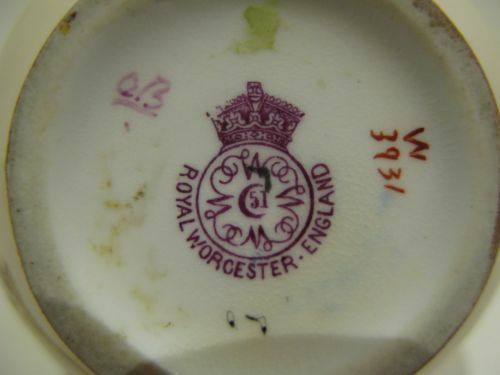 Standing approximately 3.7/8"diameter x 1"high, it has the puce factory stamp for 1941 and is in very good condition with no damage, crazing or restoration, and the gilding showing only the slightest signs of wear. 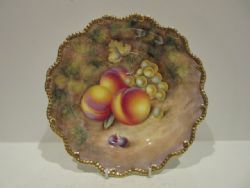 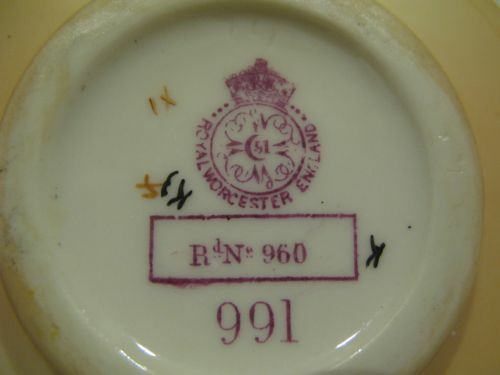 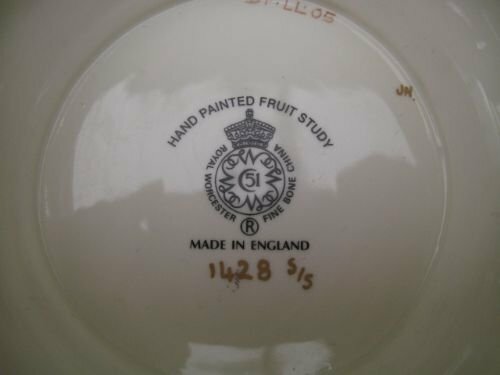 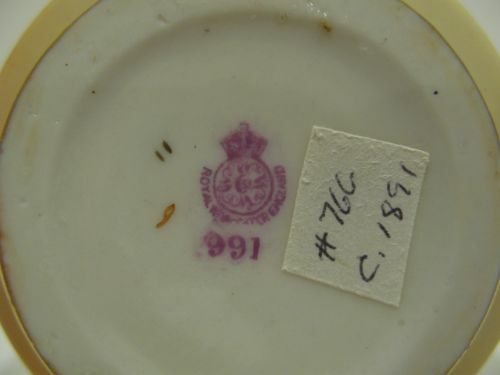 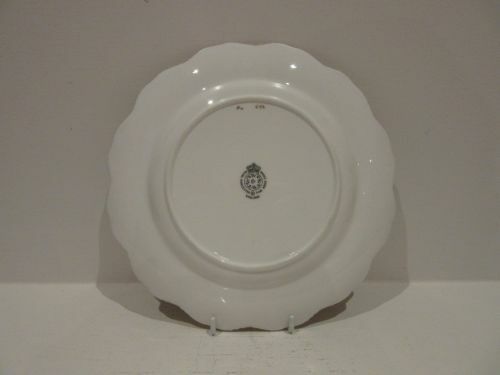 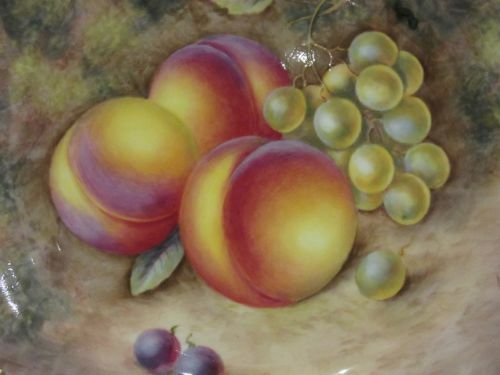 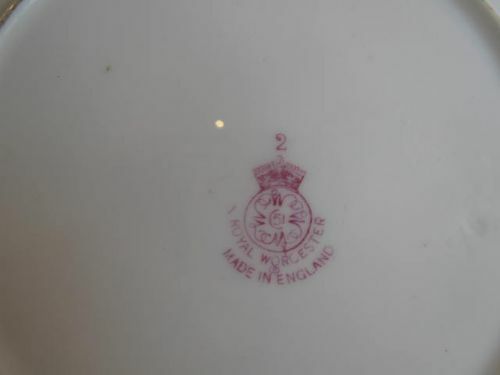 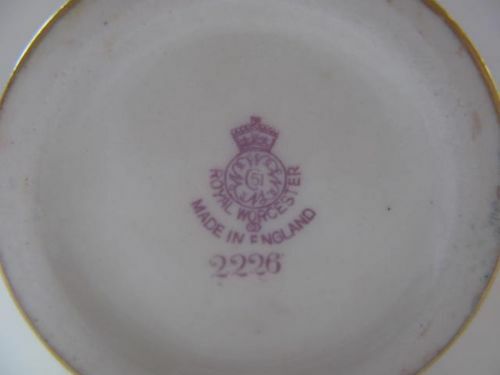 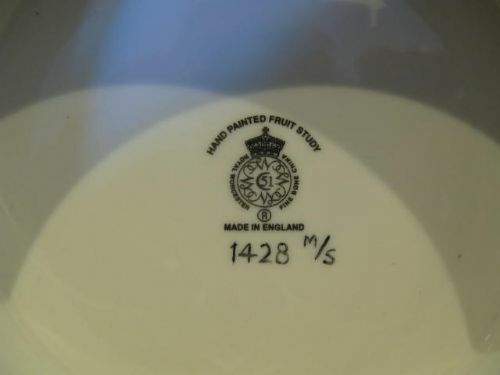 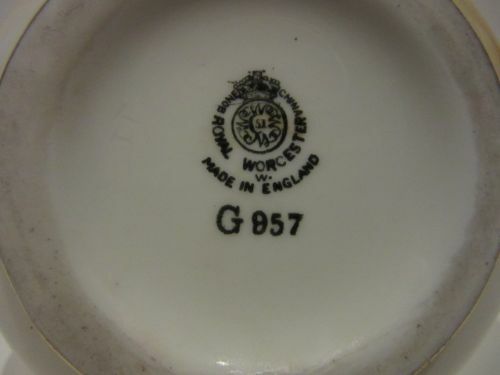 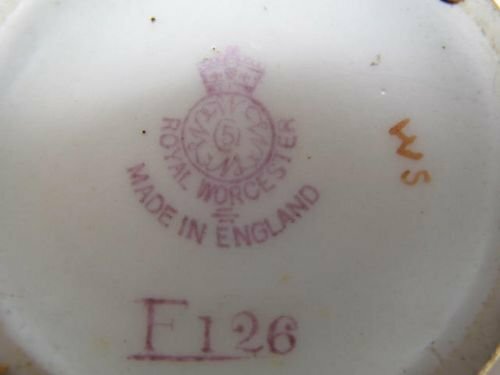 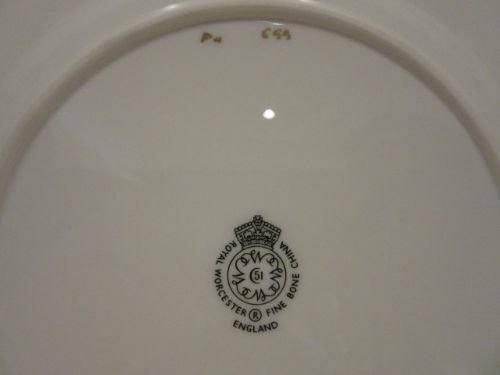 A Royal Worcester Fruit Cabinet Plate By Ayrton. An excellent Royal Worcester porcelain "star" cabinet plate, with shaped and heavily gilded gadrooned rim and very well painted fruit decoration against a mossy background by Harry Ayrton. 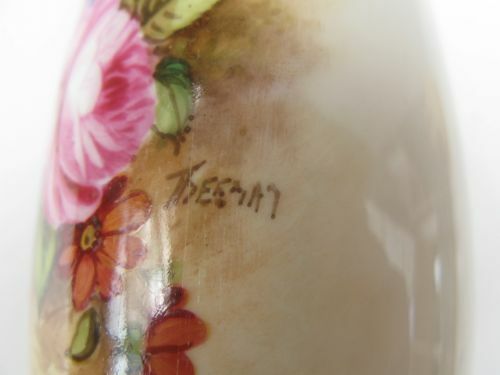 Measuring approximately 8.3/4"diameter x 1"deep, it has the black factory stamp for circa 1970 and is in excellent condition with no damage, crazing, scratches or restoration and the gilding is bright and virtually without wear. 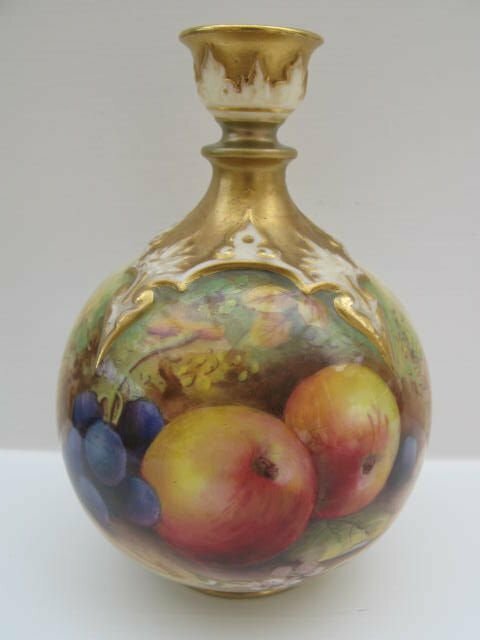 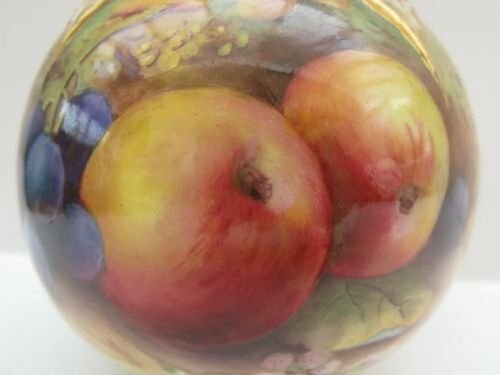 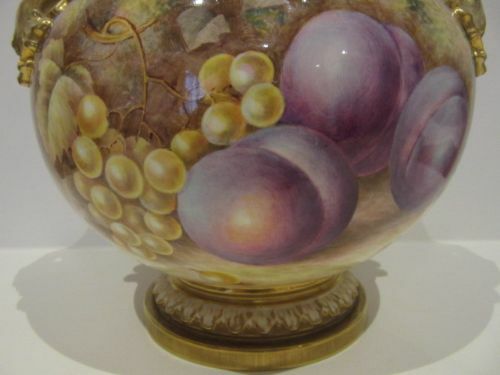 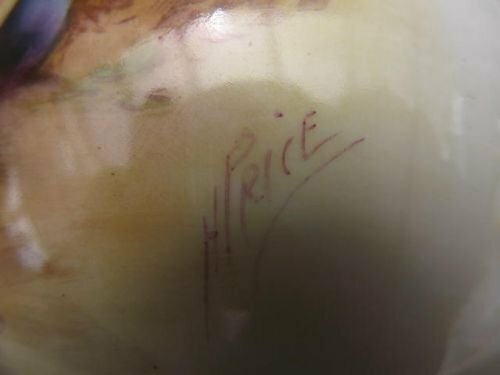 A Royal Worcester Fruit Decorated Vase By Horace Price. 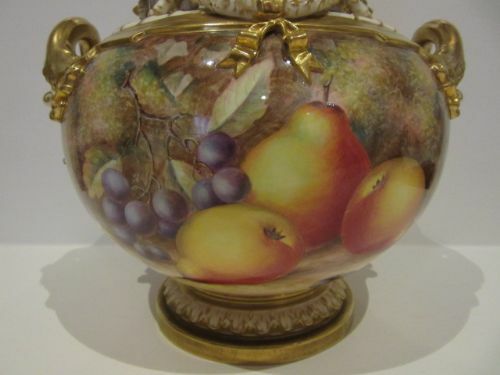 A Royal Worcester porcelain vase, shape number F126, with well painted fruit decoration by Horace Price. 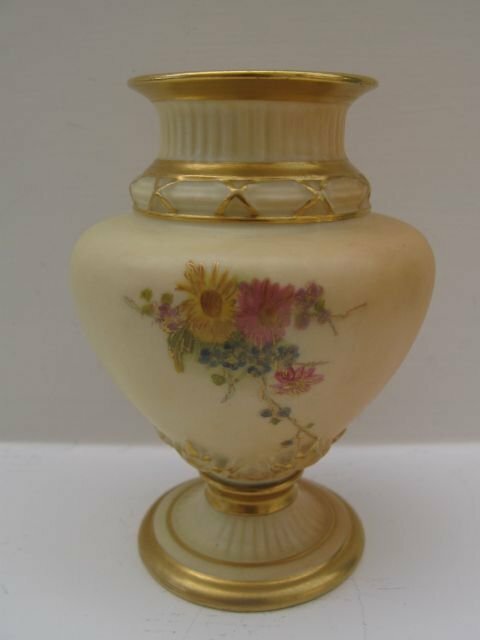 Standing approximately 5" high x 3.1/2" diameter it has the puce factory stamp for 1930 and is in very good condition, with no damage, crazing or restoration, and the gilding is unworn. 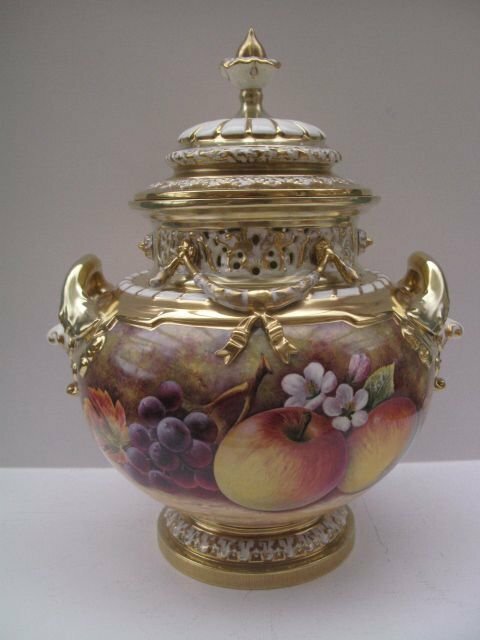 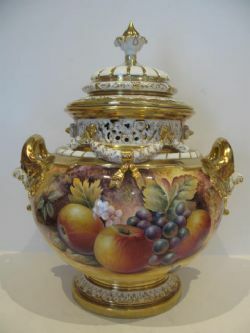 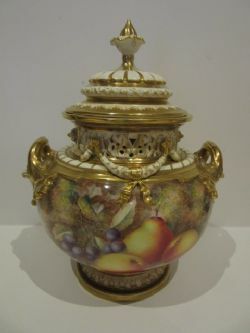 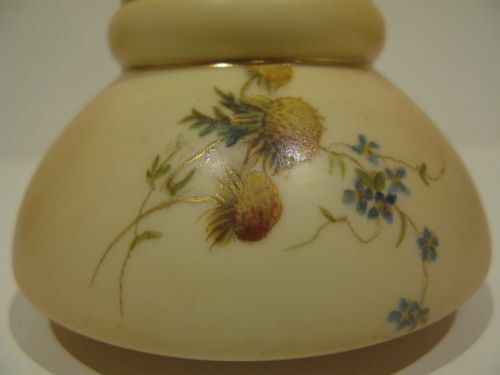 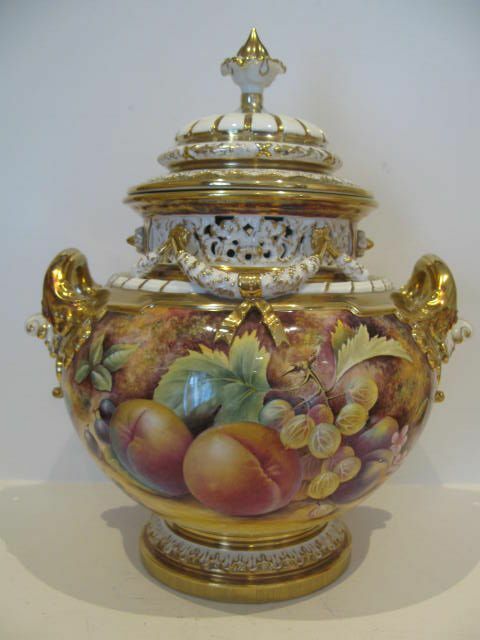 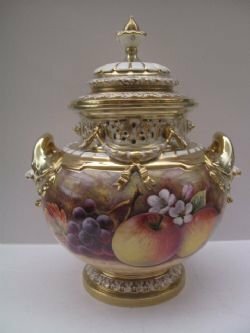 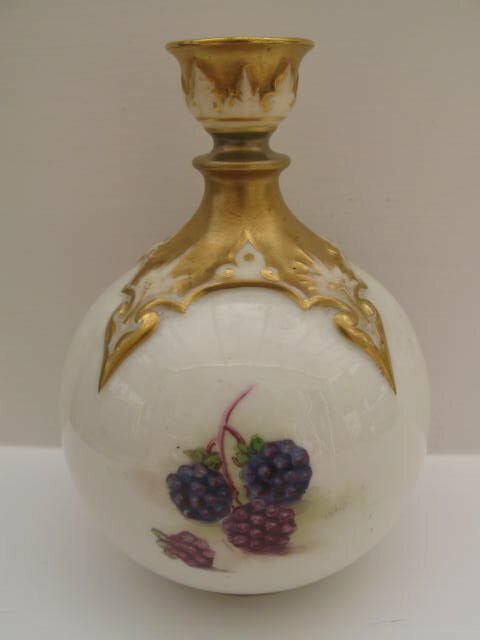 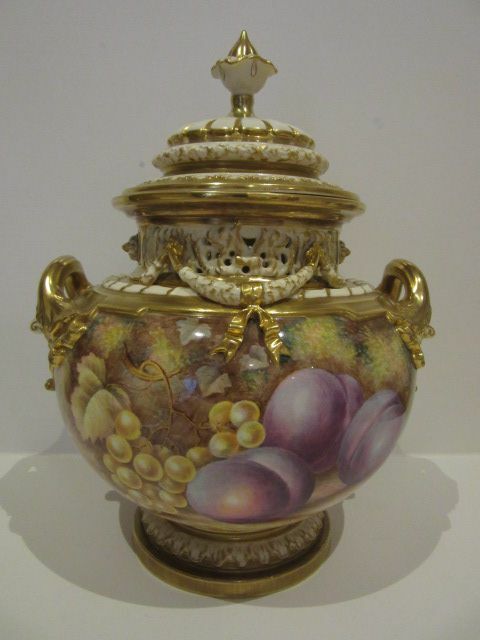 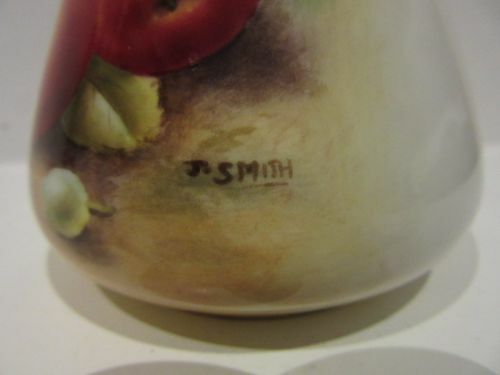 A Royal Worcester Fruit Decorated Vase By J. Smith. 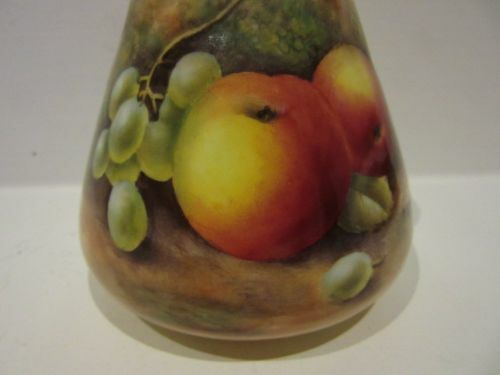 A Royal Worcester porcelain vase, shape number G957, with painted apple and green grape fruit decoration against a mossy background by John Smith. 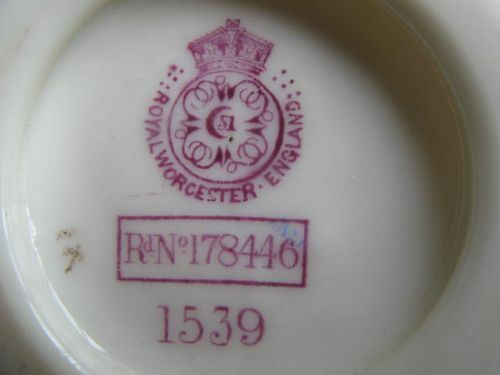 Measuring approximately 3.1/4"maximum diameter x 3.1/4"tall, it has the black factory stamp for 1951 and is in very good condition with no damage, crazing or restoration and the gilding is bright and shows only very slight signs of wear to the rim. 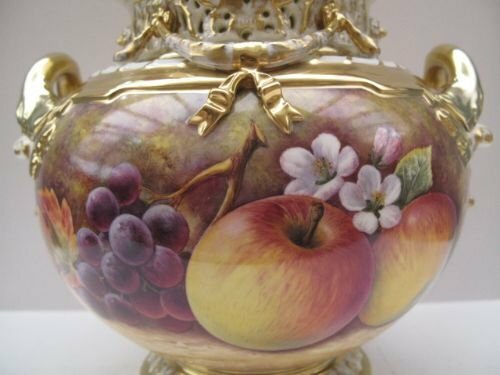 A Royal Worcester Fruit Painted "Bow" Vase And Cover By E. Clark. 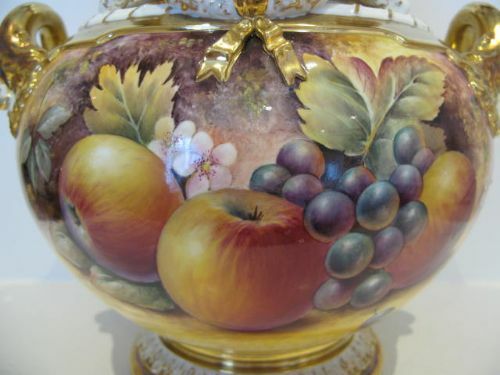 A handsome, Royal Worcester "Bow" vase and cover, with well painted all around fruit decoration by Eddie Clark. 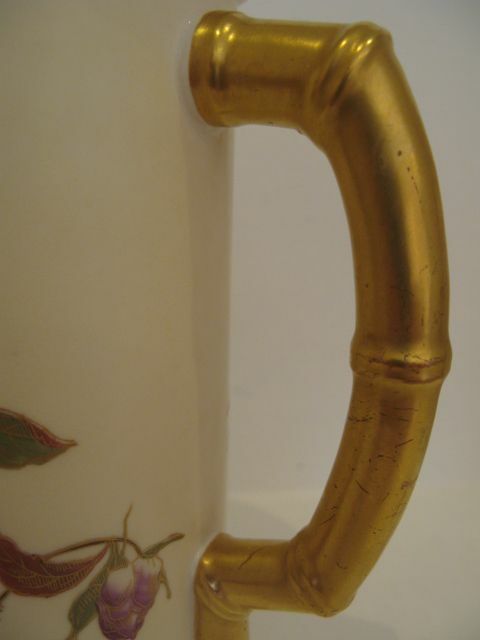 Standing approximately 13"overall height x 10.1/2"wide over the handles, it has the black factory stamp for the last quarter of the 20th century, and is in excellent condition with no damage, crazing or restoration, and the gilding is fresh and bright, without wear. 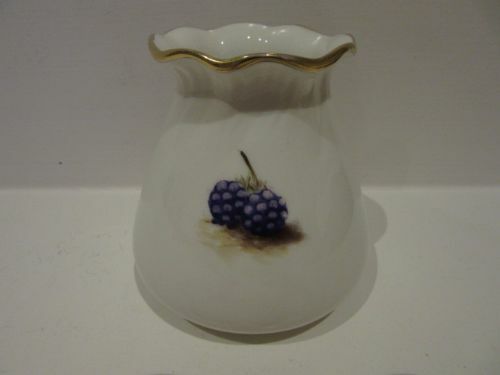 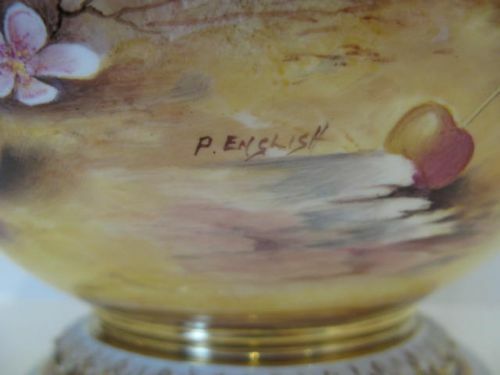 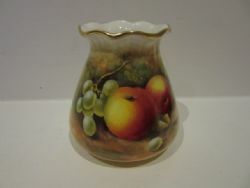 A Royal Worcester Fruit Painted "Bow" Vase And Cover By P English. 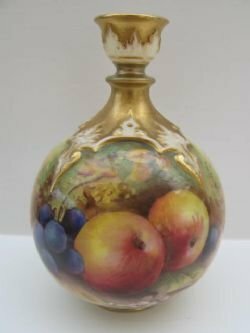 A fine and impressive Royal Worcester "Bow" vase and cover, shape number 1428 medium size, with well painted all-around fruit decoration by Paul English. 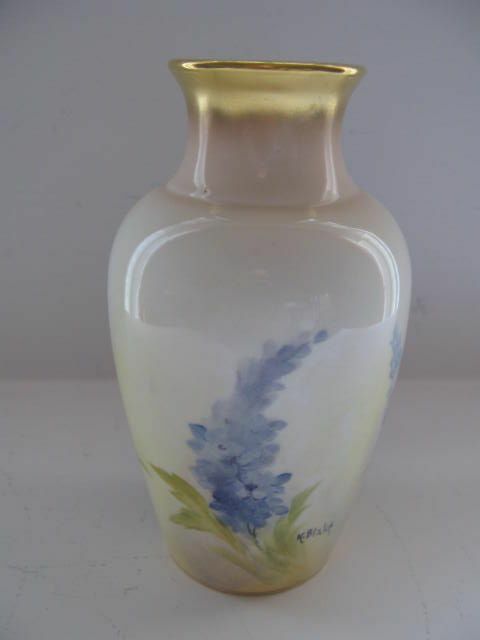 Standing approximately 14.1/4"tall x 12"wide over the handles, it has the black factory stamp for circa 1990 and is in excellent condition with no damage, crazing or restoration, and the gilding is bright and without wear. 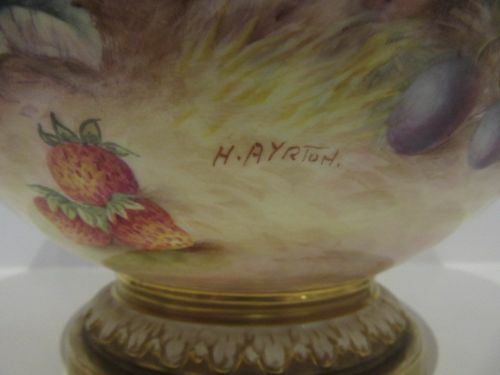 A good Royal Worcester porcelain "Bow" vase and cover, shape number 1428, with all-around well painted fruit decoration by Harry Ayrton. 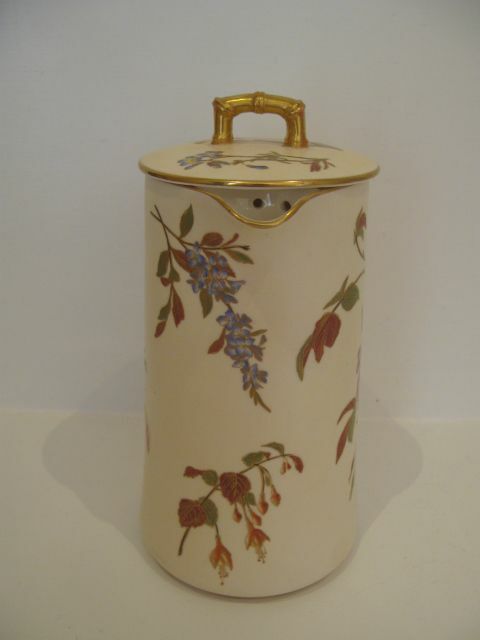 Measuring approximately 12"overall height x 9.3/4"wide over the handles, it has the black factory stamp for circa 1965/1970 and is in excellent condition with no damage, crazing or restoration and the gilding is bright and virtually without wear.